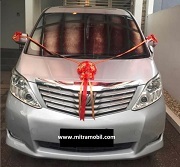 Mitra Mobil Car Rent for personal, family and business purpose. Mitra Mobil provide all type of car rental service in Jakarta and JABODETABEK. Trusted, Secure and Reliable! Monthly Car Rent is a type of car rental with a minimum duration of one month. This monthly car rental package is suitable for personal use or corporate use. Routine service every 5,000 KM at our representative Mitra Mobil workshop. Engine oil replacement and car spare part replacement cause by the age of usage. Car license renewal once a year. Our company will help customer to renew the car license every year. Car replacement if the car have engine problem which is not cause by customer driving accident and we need more than 24 hours to fix the car starting from the car arrived at our representative workshop. Tire replacement and tire burst due to customer negligence. Insurance claim, if there is an accident the fee is Rp. 300,000/ broken spot. Towing costs in case of an accident. Replacement car if the car broken down because of an accident caused by customer negligence.